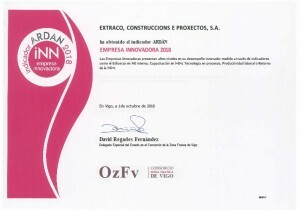 Extraco has obtained the Ardan indicator ‘Innovative Company’, a sign given to those Galician companies that show high levels of innovative performance, measured through indicators such as the effort made in internal R&D, R&D&i training, process technology, work productivity or R&D&I return. The research and development projects carried out by the company in the last year, as well as its innovative performance have been essential to distinguish Extraco with this specific credential, boosted by the Consortium of the Free Trade Zone of Vigo. This entity develops, through the business information system Ardan, a line of indicators that distinguish those companies that lead their activity and outstandingly solve issues related to business management. Ardan’s indicators are backed by University research groups and are annually reviewed and updated, so they permit to verify the business reality and provide the companies with measuring instruments for a better strategic and competitive positioning. Extraco is currently working on three R&D&I projects: ‘Alfiller’ -for the recovery of the asphalt plant rejection filler for the development of cement-based eco-products -, ‘Geo4Radón’ -aimed at forecasting and improving geothermal heating and analyzing the influence of sounding in radon gas diffusion-, and ‘Topacio’ -which aims at developing new technologies to optimize infrastructure management for the prevention of forest fires -.